As many of you will know, it has become a tradition to judge the Future of Money Design Competition at Consult Hyperion’s annual Tomorrow’s Transactions Forum in London in the Spring, recognising the role that art plays in helping us to understand what fintech might do and what transactions might become, beyond the limited imaginations of us in the industry. 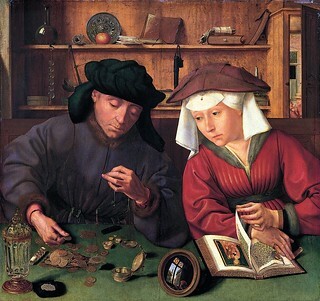 In fact, we have long entrusted the task of representing our ideas of value to members of two professions that might seem to have little in common: banking and art. The truth is, we at Consult Hyperion ran the first art competition at the Forum a few years as an experiment and for fun. We’re always trying new things at the Forum. Some work, some don’t. Having come across some fantastic work in the field of money by students at the Royal College of Art, I thought the art competition would be enjoyable, but I was taken aback by just how popular it was. The delegates really enjoyed — and appreciated — the opportunity to see aspects of the future of transactions from an entirely different perspective. In the Gilded Age, many of the banks that have recently played important and devastating roles in our financial life—Goldman Sachs, JPMorgan, Lehman Brothers—were guided by men who had a passion for painting. You’ll be pleased to know that the tradition continues. As it has turned out, our delegates not only liked art, but they liked challenging art. So here we go again! The Future of Money Design Competition for 2015 is now open and accepting entries. This year’s competition, again sponsored by our good friends at the excellent payments processing and fraud prevention company NCR Alaric, asks artists to design monetary systems based on ethics. Should a payment card act as a policeman or an anarchist? A Bitcoin imbued with reactionary ideals or an M-PESA that aims at non-bank inclusion? Should payments be anonymous or tracked? Opaque or transparent? Almost any functionality can be created to the extent that, the limits to monetary development are not technological. The limits are bound within the social realm and are tangled within ethical philosophical questions that arise through living. We will be challenging creative thinkers and tinkerers to design an alternative electronic monetary system, which adheres to an ethical philosophy. If ‘John Stuart Mills’ were to design an electronic monetary system, what would it look like? How would a pragmatist ‘William James’ inspired monetary systems operate? Or a ‘ Russell Brand’ socialist egalitarian money ecosystem? We are not looking for patentable technologies, but hopeful (or woeful) visions of an alternative digital payment system which might inform which monetary systems we use, and what future systems might exist. Please visit the competition web site for more details and tell your friends! Making money is an art. Not only figuratively but also literaly! Take a few seconds to study the notes in your wallet…and you’ll see you’re carrying a magnificent work of art in your pocket everyday. ← What is "appropriate" AML?